Vernee Mars is one of those smartphones that promise great performance without needing you to break the bank. It features a large FHD display, an octa-core processor, and 4GB RAM, amongst other impressive features. You are going to be awed by the build of this low midrange phone. Vernee Mars sports a body made of dual anodised metal. The 161g device is slim as well at 7.6 millimetres. This is definitely not one of those affordables you wouldn’t want your friends to see you with. 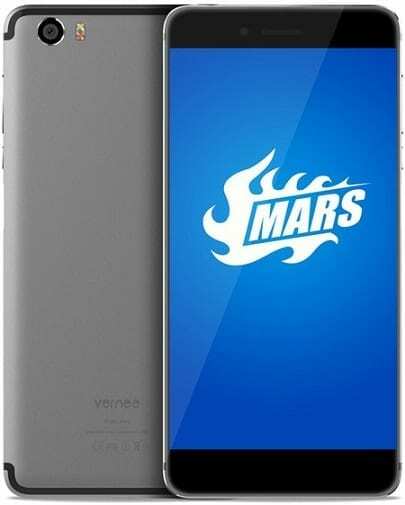 Vernee Mars packs a huge 5.5-inch IPS display. This boasts Full HD resolution of 1,920 x 1,080 pixels. The touch screen supposedly uses the same technology you will find in the iPhone 7. So, great visuals may be expected. There is also 2.5D curved glass. On the rear of the Vernee Mars is a robust looking 13 megapixel shooter. This features Sony IMX258 sensor that used to be on flagship devices couple of years ago. It has dual LED, dual tone flash and phase detection autofocus. A 5 megapixel Samsung camera covers you for selfies. You get 32GB onboard storage for keeping your photos and Full HD (1080p) videos that the device shoots. A hybrid SIM slot allows storage expansion in case this is not sufficient. With an octa-core MediaTek Helio P10 chip under the hood, the Vernee Mars shows potential for robust performance. It has four Cortex-A53 cores running at 2 GHz and another four at 1.2 GHz. There is 4 GB of DDR3 RAM to ensure applications and games respond fast enough. As for software, the phone boots stock Android 6.0 Marshmallow OS. This raises possibility of being able to update to Nougat. Powering the Vernee Mars is a 3,000mAh Li-Polymer battery. Its maker’s VCharge technology lets you get up to 50 percent battery capacity in just half an hour. There is a fast fingerprint sensor beneath the power button that is said to get the phone unlocked in only 0.1 second. You also get a reversible USB Type-C port connector at the base. Vernee Mars is available in Nigeria, Ghana, and Kenya. The price starts at $108.99 at Gearbest. You can buy the smartphone at leading online stores in your country. Vernee Mars Price in Nigeria is expected to range from 61,000 Naira to 90,000 Naira.